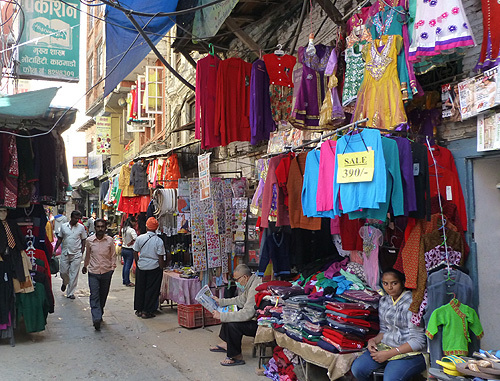 If you're a Shopaholic, beware, Thamel and Kathmandu have a plethora of beautifully coloured lined Streets full of Market Stalls and Shops! Although the picture above shows some clothes with prices on, like many other Countries 90% of the Shops and Stalls don't show any so you enter a possible transaction with an open mind. It is completely acceptable to barter for most things in Nepal. The Owner will usually ask you what you're interested in and will give you a Price, it's then up to you to go from there. I tended not to barter on cheaper things, if an item was say £1 in English money, bearing in mind it's probably a quarter of the price you'd in your own Country, you pay it. Equally, if you're buying a dozen (as I did with some Hats for gifts at 70p each) then go ahead. If the latter or on larger more expensive items, the Shop owner will often ask you what you would like to pay. It's the same as any where else, you want a bargain but give respect to the fact they have to make a living the same as anyone else. I didn't come across any 'over the top hard sell', if I said I wanted to look somewhere else, they were always quite understanding. There are quite a lot of what we would call small Supermarkets and Convenience scattered around Kathmandu and Thamel in which everything is price fixed of course. Most cater for all Countries and Creeds, if you're from the UK there's no problem with Butter, English Marmalade, Soups, Confectionary and Cereals etc! Try th local Honey though, best I've ever tasted! For Fruit, buy from the many smaller Shops, Stalls and Vendors using their Bicycles as a Mobile Shop. Ensure you wash them though. Bottled water is very cheap wherever you go, a 2 litre size starts anywhere from around 15p (20 USA cents). Shopping is a real experience in this wonderful City, the secrets are to be confident, be sensible with your bartering and don't appear to be patronizing. Everyone is very welcoming, in a number of Shops I went into they offered me a cup of Tea or Coffee, it's all part of their Culture and respect for Tourists who are boosting their lifestyle. 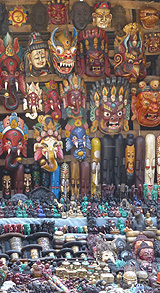 Most Souvenirs and other items sold are made in Nepal. Check first and support their economy.